The common myna, also called Indian myna, is a starling bird species originally home in wide parts of south Asia as India and the countries west and east of it, including the Malay Peninsula and parts of, if not the whole of Indochina. The term 'myna' is a derivate from an ancient sanskrit root which evolved to the word 'maina' in contemporary Hindi language. The bird reaches a size of about 23 centimeters; it's clearly distinctive from other birds by it's remarkable colour pattern with it's black head, yellow yard around it's eyes and the brown coloured body. Male and female look almost identical, but the female is slightly bigger. In Southeast Asia the common myna is an all-day appearance. Their habitat is originally open forest, but they spread out to agricultural areas and entered and adapted perfectly to urban areas. 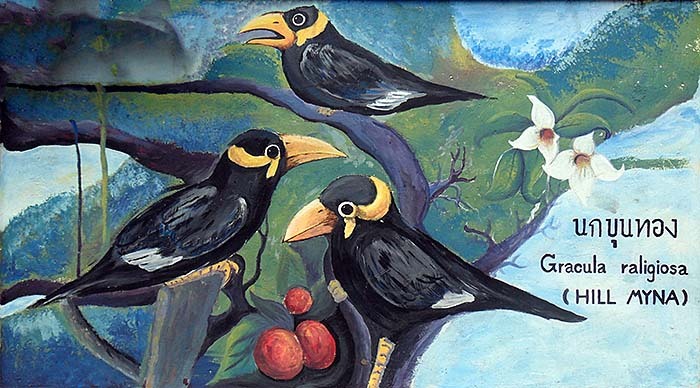 In the 19th and 20th century common mynas were introduced into many countries worldwide with the intention to reduce the local insect populations. It's adaptability and success to survive in foreign countries results mainly from being an omnivore and it's robust and belligerent nature. The common myna is able to drive other birds out of their claimed habitats. They also rob and destroy other bird's nests and eat their chicks. Since they cause a great deal of harm to other animals, the common myna is listed as one of the hundred worst invasive species in the world. Particularly in Australia they are notorious for damaging the local ecology, mainly other bird species, but also in South Africa and wide parts of America they spread out in great numbers and do a lot of harm to local species and environments. Sketch of a common myna as seen in a garden. In this context it's interesting to see that the common myna population in Malaysia and particularly Singapore decreased significantly for it's competition with another germane species, the Javan Myna. The Javan Myna was introduced to Singapore in the 1920s. 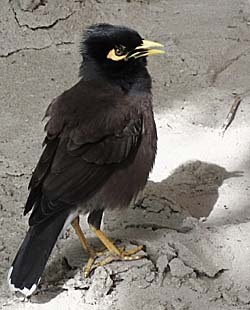 By the way, the common myna is also known for spreading mites and diseases to people and domestic animals. Common mynas usually feed mostly from insects (particularly grasshoppers), but also lizards and other reptiles, small mammals, seeds, grain, and fruits. They also feed from orchards or sometimes pick fruits from plates at peoples homes (outdoors). They feed from rubbish as well and are sometimes seen in groups around open waste sites or places where people depose their kitchen waste. 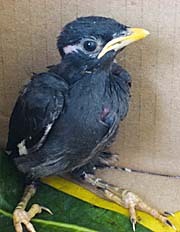 Once I found a common myna chick in my garden in Trang. It was fallen out of it's nest and couldn't yet fly. I caught it and put it into a box to bring it up. While I was chasing it in the garden, the little fellow screamed noisily around, trying to escape me. His croaks called a great number of his conspecifics who gathered around on the electic wires and neighbouring roofs to watch what's going on, uttering noisy sounds. Must have been a hundred of them who came together. Despite Hitchcock came in my mind I didn't expect them to attack me. Later I read that there are recorded incidents of common mynas attacking people. So, after all, very interesting is their high developed social behaviour. It's a habit of these birds that they meet around sunset with other birds of their own species and also other species of starlings and crows and more to roost in certain places like particular trees or big bushes. There sometimes greater numbers of birds, up to a thousand, gather together and exchange information about food places etc. They warn each other in the case if there is a potential enemy around. They often also utter a certain sound when they are about starting to fly off. 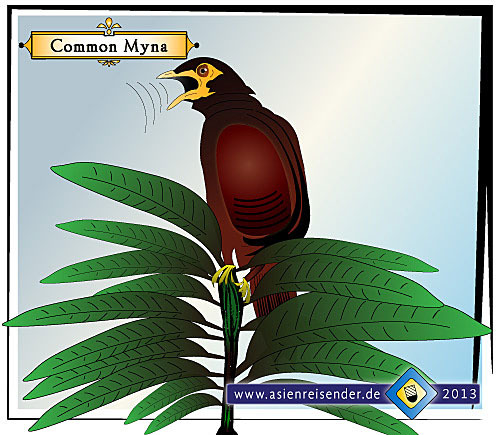 Since the common mynas have a differenciated communication system, they are able to produce a variety of different noises. They are also able to imitate human language. Sometimes, but not often, a common myna is to see in a cage kept by people. 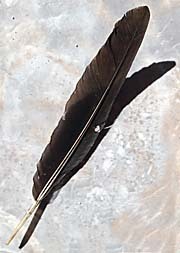 Particularly many Thai People keep birds, but usually they prefare other kinds of singing birds with splendid plumages. Some people find the sounds of the starlings quite annoying if they appear in big groups. In fact they can be pretty noisy. Common mynas are monogamous, like ducks and geeze, and they usually appear in pairs. They become particularly aggressive in their mating season. Then they build up a nest made of grass, roots and twists, sometimes leaves and plastic rubbish added. The female lays usually four to six eggs who are white, with a scratchy pattern on the surface and about two to three centimeters long. 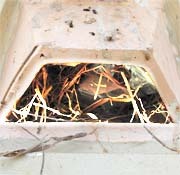 Breeding time is below three weeks and the fledging time three to four weeks. 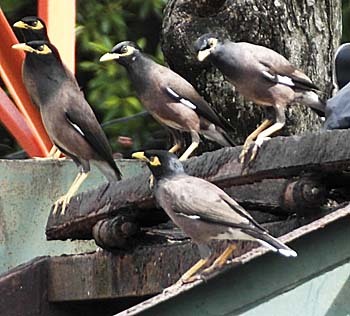 In the breeding time there starts a high competition among myna couples for nesting sites. Not seldom violent action is taken by a couple attacking another couple who settled already a nest at a good place. The fighting birds sometimes fall down to the earth, the opponents holding each other in their claws, picking with their beaks heavily on the rival. A lot of noise is uttered and finally the defeated couple leaves the spot to look for another place. Remarkably the mynas breed in very different altitudes, from the sea-level up to mountainous altitudes of 3,000m.